[AUTO](VC/RC):Harmony (When your other unit is placed in the same column as this unit, both units become in harmony until end of turn) [CONT](VC/RC) Generation Break 2:If this unit is in harmony, this unit gets [Power]+5000. Then, if this unit is on (VC), [Critical]+1. [AUTO](VC):[Counter Blast (1) & Soul Blast (1)] When your G unit Stride, you may pay the cost. If you do, draw a card, choose up to two of your rear-guards, and return them to your hand. New Lauris...who is basically pretty much the old Lauris warts and all. At least at first glance: this one costs 1 Soul as well for the Stride skill, but in exchange, you don't need a field, unlike old Lauris who was weak to board-wipe. Oh and she can gain 5k even on RG circle. So which is better? Against anything that doesn't murder fields, original Lauris beats this due to less Soul requirements. 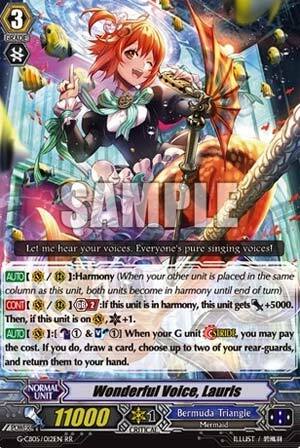 Also there's a bit of a difference in the GB2 wording, so if for whatever reason OG Lauris loses the unit it's in Harmony with, she keeps the 5k bonus, so there's more defensive plays with your G-Guardians, unlike this Lauris who needs to BE in Harmony, not BECOME in Harmony. But name is name, and she has relevance on RG circle, so run both. Just focus on old Lauris as the ride against non-RG ruining decks. More Harmony supports! Lauris here isn't quite as good as her original counterpart apart from her ability to function as a rear guard. Her stride skill at least is able to draw regardless of rear guard totals so that's a plus. Not bad, but harmony needs more to be the upper Bermuda deck in the game.